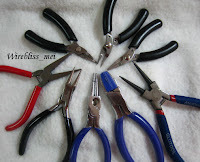 Continuing from my posting on jewelry tools, here are my favorite and they are the ones that I use most often. Personally, i use a lot of the round nose, bend nose and flat nose plier. Round nose because i make a lot of loop with it and bend nose to hold the loop while i secure the loop. The flat nose most of the time is for straightening the wire or close the jump rings (i haven't got myself a crimp plier yet)...that will be my next purchase.